The 2017 edition of PNG’s biggest sporting and social event, the Trukai Fun Run, was launched today at the Royal Papua Yacht Club. 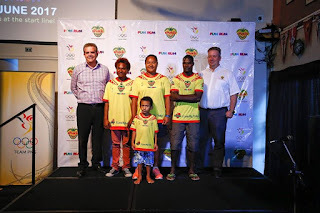 During the launch there were remarks by Sid Yates, Fundraising Chairman of the Papua New Guinea Olympic Committee (PNGOC), and superfish Ryan Pini on behalf of Team PNG athletes. Unveiled at the launch was the 2017 version of the famous Trukai Fun Run T-Shirt and a stirring video capturing the far reaching extent and impact this one event has across the country, just from the sale of these T-Shirts. In what is a dream promotional opportunity for business houses, there are 100,000 Trukai Fun Run T-Shirts available in 2017 for purchasing and branding. The T-Shirts have been specifically designed so that organisations can place their brand on the front-centre-most section of the T-Shirts; A prime advertising spot for what have become iconic T-Shirts worn for many years. While the starting pistol for the actual Trukai Fun Run event will sound Sunday, 11th June across the entire country, today's launch signalled the start of the all-important fundraising period prior to this event. The Fun Run is PNG’s single largest fundraising event and is estimated to be the largest social and sporting event in PNG with an estimated 80,000 participants taking part in 2016 throughout 16 centres nationwide. The objective of the 2017 Trukai Fun Run is to raise funds to help Team PNG compete at three major international events in 2017. They include the Commonwealth Youth Games in Nassau, Bahamas (19th-23rd July), the Asian Indoor and Martial Arts Games in Ashgabat, Turkmenistan (15th-24th September) and the Pacific Mini Games in Port Vila, Vanuatu (2nd-14th December). The annual Fun Run event is a PNG Olympic Committee initiative, which commenced 34 years ago in 1983. Speaking at the launch, Trukai’s National Marketing Manager, Maybellyn Fernandes called on local organisations across the country to partner with the PNGOC and Trukai to host the Fun Run event in their local towns. She also urged the public and private sectors to attend fundraising auctions on Wednesday, 8th March in Lae and Thursday, 9th March in Port Moresby. “The auctions will provide organisations from the public and private sectors the opportunity to support this fundraising drive through the bidding of Fun Run T-Shirts for selected schools,” said Ms Fernandes. “The T-Shirts secured during the auction directly go towards helping Team PNG, but they also help the schools which they are bid for. Schools are able to earn additional income through the selling of donated T-Shirts to fund important school projects and buy much needed equipment. Trukai has been the major sponsor of the Fun Run since 1999 and their support has turned the Fun Run into the single biggest event on PNG’s sporting and social landscape.